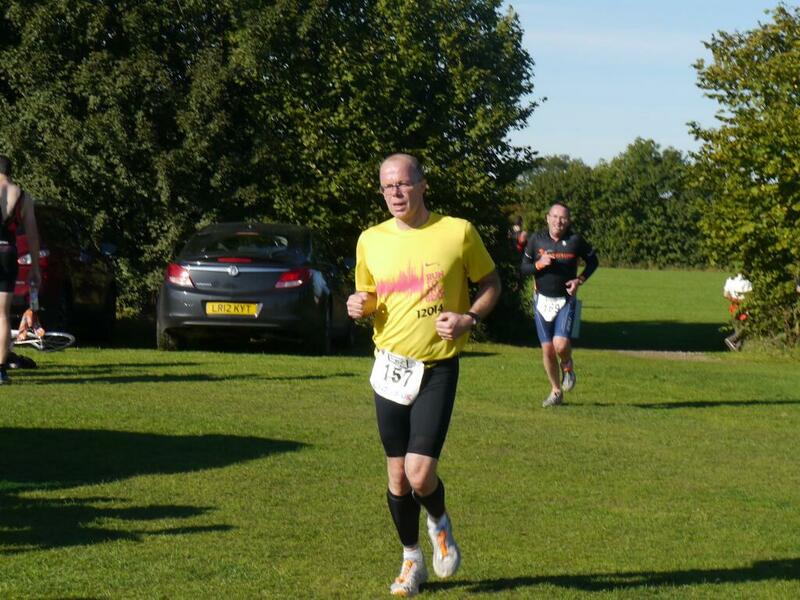 Today was the Great Notley Duathlon. I had in my diary to take part in the Southend on Sea 10K which was also today however a few weeks back Mr SMCC Ian Tovell aka Goldie aka @Sprocketwaffle tweeted that he had signed up for this event. This was shortly followed by Mr IronMan himself David Singleton aka @itsdsingleton and well – it would be rude not to have entered myself. To be honest I don’t really like the SOS 10K route – out and back along the seafront – and I am thinking I am better over shorter distances and multi-sport (cycling is my best discipline) so it wasn’t a hard decision to make. So I entered – and the banter began. And continued. Which was good. The Great Notley Duathlon is a 4km / 20km / 4km affair centered on the Great Notley Discovery Centre near Braintree in Essex organised by www.Born2Tri.com All the details can be found on their website. The run was all off road on grass and stone paths around the country park with a horrible ascent and decent of the Kestrel Hill. Both runs followed the same route so we did it twice. The bike was two laps of a circular route from the Discovery Centre with 70% on country roads and 30% on the A130 dual carriageway. I left in a rush but got there early (I never get this right) but managed not to forget anything vital. 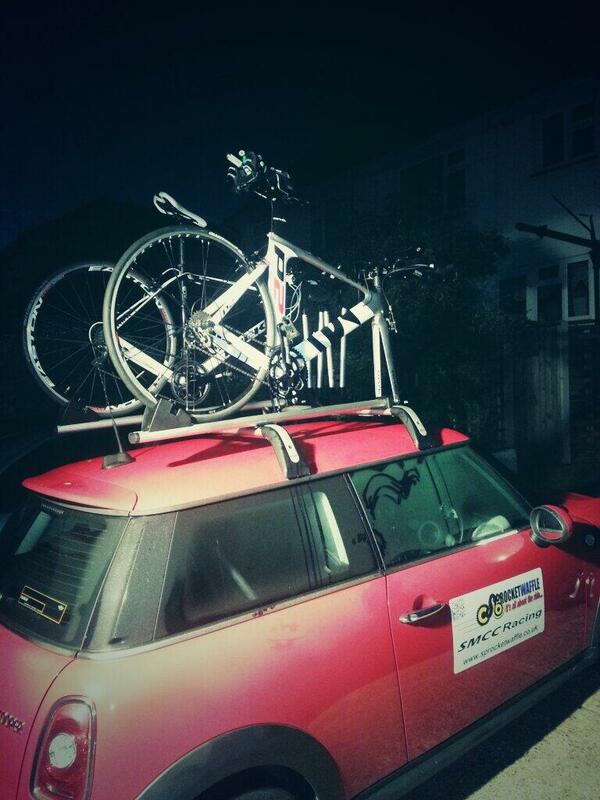 Ian and Dave having traveled together in the SMCC team car were already there (very keen). This was especially impressive as Dave had cycled the 10 miles to Ian’s gaff in Southend first (really very keen). It was blooming cold when I got there. I racked the bike nice and early in the rather lumpy and grassy transition giving plenty of time to return and check I hadn’t forgotten anything. And move things. And check again. And move things. Over at David and Ian’s selected rack we talked colours of visors on our aero helmets (well David did) and we got a bystander (another competitor) to snap a group photo. And then another group photo as the first one made it look like David had a racy hairdo (tree in background). I had a pee. had another pee. Then another (can’t get this right either). Then there was the briefing. Then the young people (inc David) were off and then off we went. And then I remembered to press go on my Garmin watch (yet another thing I can’t get right). Me just before the off. I went off a bit too fast I think and left Ian behind. This felt good. I then slowed down and he passed me. This felt less good. The route was around the park and whilst I felt a bit sluggish it was okay. I wasn’t keen on running on grass in places and uneven ground if I’m honest but hey-ho. Then we went up the hill which was slow but steady. I didn’t like coming down the hill on wet grass in slippy soles. I finished the first run in 17:12 which was okay. Rank 84. And then we were into transition T1. Having started down the wrong aisle I found my bike. Kit change went okay although slow as I have ratchety road shoes and not velcroy tri shoes. Next time I shall wear my mtb shoes which have flat solees for running in with SPD cleats and just two velcro straps. Don’t know why I didn’t today to be honest. Out of transition I nearly crashed into a couple of bikeists who had stopped to leisurely get on their steeds. I just squeezed through and did a semi flying start after which I struggled a bit to get my feet clipped in. Another reson for the other shoes as the spd cleats secure much easier. I really enjoyed the bike. It felt hard to start with but that was probably just settling in after the run. The first section was a little up and down (barely) which didn’t help but I soon got into my stride and into an aero tuck – and then I flew (for me). It was the first time I have used aero bars and I had adjusted my bike setup for speed (saddle up 1cm, bars down 2cm, shorter stem by 3cm) and it was great. Really happy. I loved the dual carriageway sections and was probably averaging 25mph+ along there. 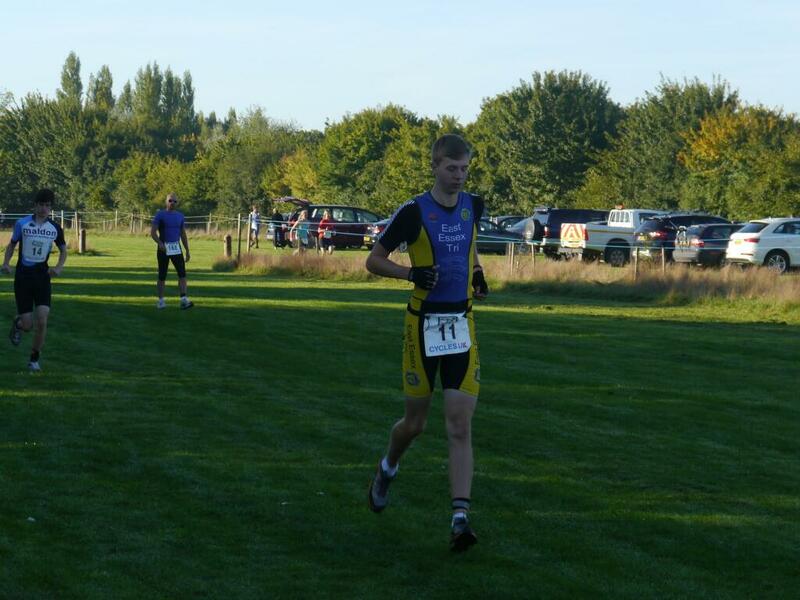 At the start of the second lap I took a gel (aka glue) which upset the rhythm a bit but pushed on. I love bike legs as I have the ability to reel people in which I did and overtook 20 or so people as reflected in my rank for the bike leg. Nearing the end of the bike – on the dual carriageway – my right calf started broadcasting that it wasn’t happy. Damn. I pushed on to transiton T2 and got through pretty quickly. And forgot to press the lap buttons on the watch at the right time and then it was out into the limp. I mean run. 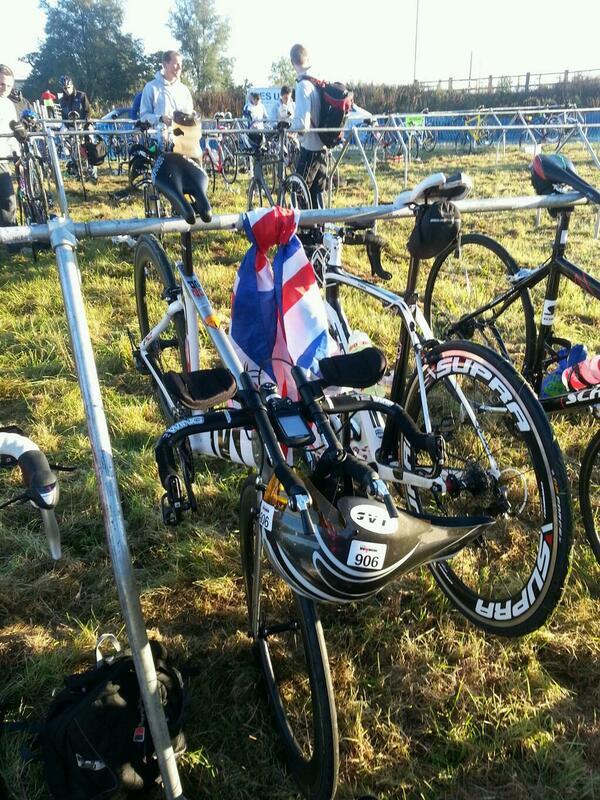 I was pleased with the bike leg completing in 39:21 and rank 48 which was a good result. I struggled with the final run big-time. The calf was not happy and I was barely jogging with short strides. A fair number of those I had overtaken on the bike then overtook me again – which was depressing – but I pushed on. Past the lake I managed to open the stride up to something more approximating a run but by the time I approached the hill I had slowed again. The Hill. I ran. I walked. I hobbled. I sort of ran and then sort of ran down the other side – in pain. My watch did at least serve to tell me the overall time which suggested I might be able to make it back in under 1:20 but then 1:19 flicked over and this seemed to evaporate. I did manage to semi sprint the last 100m or so and the support at the finish was brilliant. I crossed the line in 1:20:09 by my watch and was greeted and cheered in by Ian and David and Davids family. A mini-David brought me a bottle of water over which was brilliant. My final run was slow even for me. 21:27 rank 94. 4 minutes slower than the first run. hey-ho. Me. At the finish. In pain. I needed a moment or two to compose myself as I was pretty knackered. More so than the Waveny Tri a few weeks back. 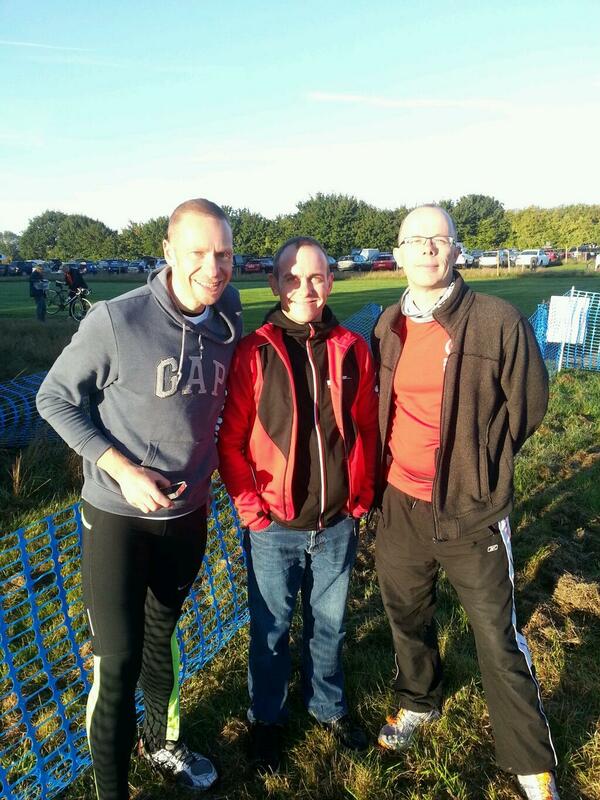 And then it was congrats all around – especially to Ian for a brilliant result in his first Duo/Tri event. Bikes and kit were retrieved and it was time to head home. By now the sun was out and it was pretty warm. As I was packing up another twitter friend popped up in Carol – aka CarolInTheCorner aka @Carol120662 – to say hi. We knew each other was there and Carol spotted me before I spotted her. Carol’s profile pic on twitter is a coffee cup. 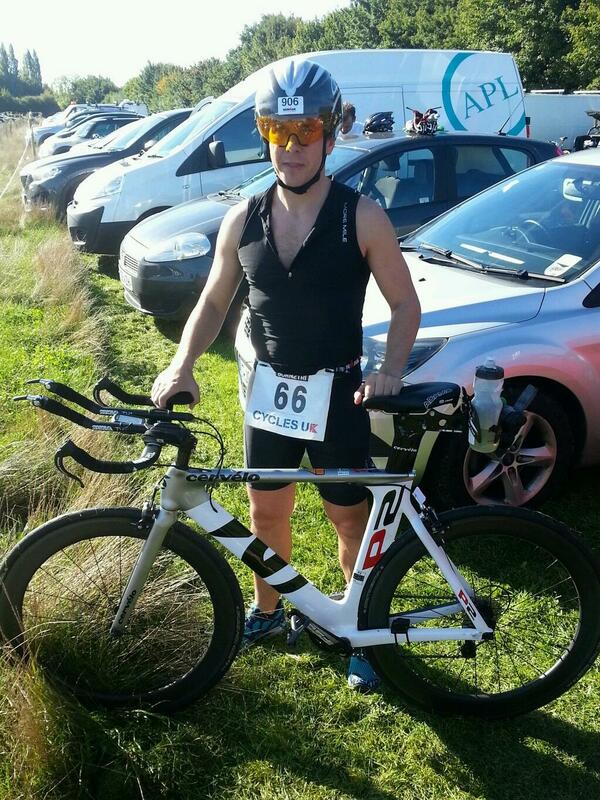 Iron Man (Wales) David Singleton looking fresh after the race. Tom. A very quick lad. So sitting here I would say I enjoyed the event. It was good to have others taking part who I knew and who did well. The conditions were great. The course was great (bike anyway). The organisation was great. I didn’t enjoy the final run at the time. I now need to repair myself and improve my conditioning and strength for next season. Or for LoSS 10K in two weeks if I take part. Oh and hope you guys don’t mind me using your photos as I took none (unusually). Great article Andy. 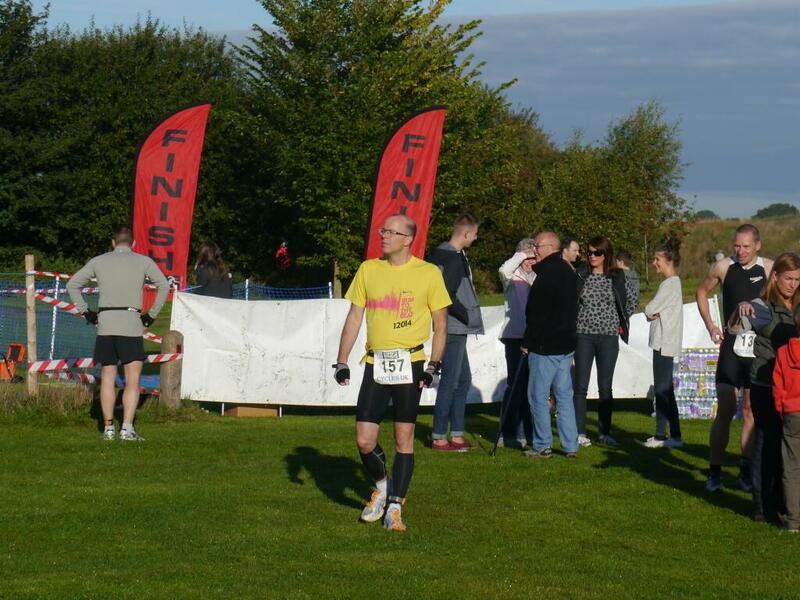 Don’t forget to enter the Great Notley Spring Duathlon next year ! !